* stellar sensor ASC DTU (large field multi-stars) equipped with 2 optical heads -the standard head (night), and a head modified for diurnal sky (red filter)- and with a catalogue optimized for stars emitting in that spectrum. 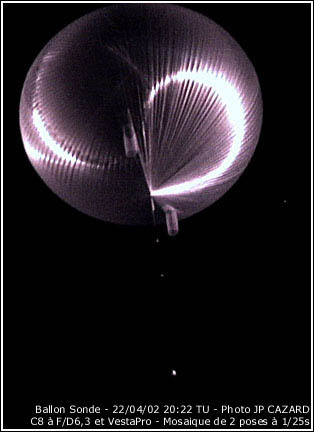 The balloon was launched by dynamic method with help of auxiliary balloons on april 22th, 2002 at 15.49 UTC. After a initial ascent phase, float altitude of 40 km was achieved at 18.33 UTC mantaining that flight level during 1 hour and 40 minutes in order to allow the balloon to carry out the transition between the day and the night, and perform the testing of the onboard equipment. At 20:10 utc the cutdown command was sent and the payload landed near the town of Foix.